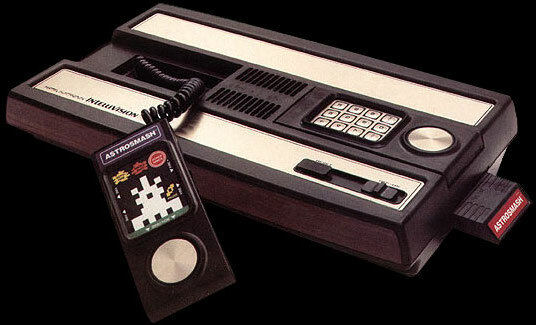 I didn't own an Intellivision at the time it had it's prime but I got to play it at my friends place. Intellivision had games such as Bump 'N' Jump, Burgertime, Mission X, Frogger & Centipede. These were all Coin-Op Conversions. The only original title I remember playing was Auto Racing. The Intellivision joypad had a round plate as a joypad which didn't function very well. It had lots of buttons though, that sadly didn't work either. Some of the buttons looked like an old telephone pad. Each game had an overlay to put above those buttons in order to get instructions of what they did in each game. The ergonomic design of how to hold the joypad and be able to push the buttons was extraordinarily bad. However you tried holding the pad, it just seemed wrong. Ironically, that makes this console even more interesting today.